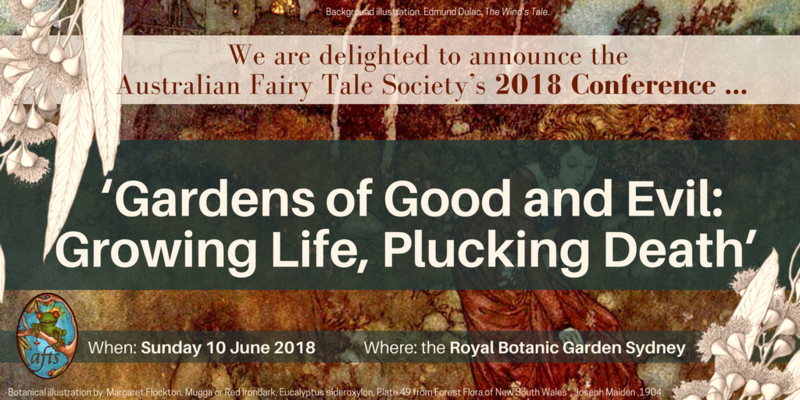 If you wish to register for the Australian Fairy Tale Society’s 5th Annual Conference in 2018, please click on the link below. Note on Registration Type: We have four different registration costs: Full Price, Student or Friends of the Royal Botanic Gardens, Member Discount, and Presenter Discount. If you choose Student Discount, please present your student ID on the day of the conference. If you choose Member Discount, you need to be a member at the time of the conference. This means you would have purchased a membership for 1 June 2018 – 30 May 2019. If you would like to do it all at once, you can choose that option too. If you have any questions or concerns about conference registration, please contact us. The conference is in the Learning Centre of the Royal Botanic Garden Sydney, with the presentations in the Maiden Theatre of that building. The closest entrance is the Woolloomooloo Gate on Mrs Macquarie’s Street/Art Gallery Road, on the left, just past the overpass over the Cahill Expressway, from the direction of the Domain and Art Gallery.